For more than 25 years, Sundance Vacations has been bringing quality vacations to our travelers at a fraction of the cost. Although we do not seek to be awarded for doing what we love, it is nice to be recognized. We take pride in all of our accomplishments and look forward to the next 20 years of providing a great place to work, great destinations and great customer service to everyone who interacts with Sundance Vacations. Conducted by the Best Companies Group, this annual list provides the “best places to work” for the state based on surveys taken by the employees of the company. Sundance Vacations awards: Sundance Vacations received Best Place to Work awards in New Jersey for the past few years! 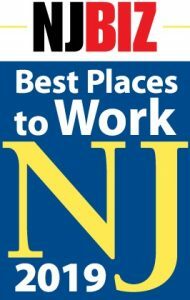 The “Best Places to Work New Jersey” list is created by the Best Companies Group. It is a study conducted in the form of survey given to employees of all the nominated companies. The Best Companies Group compiles all the data from these surveys and ranks the winners on a final list of 100 businesses. Employees are asked to rank the company based on a variety of topics like: Benefits and Policies, Engagement and Satisfaction. Other companies ranked on this list include: Mercedes Benz, Edward Jones and Esurance. Named to in 2019 – Placed among large companies. Named to in 2016 – Placed 21st among large companies. Named to in 2015 – Placed 12th among large companies. Read more about Sundance Vacations Best Places to Work NJ 2015 here. Named to in 2014 – Placed 12th among large companies. Named to in 2013 – Placed 29th among large companies. Named to in 2012 – Placed 30th among large companies. Sundance Vacations has been honored with a Glassdoor Employees’ Choice Award, recognizing the company is the 17th best place to work in the nation for small-to medium sized businesses. 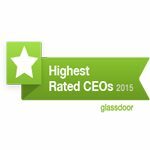 The Employees’ Choice Awards program, now in its 11th year, is based solely on the input of employees, who elect to provide feedback on their jobs, work environments and companies on Glassdoor, one of the world’s largest job and recruiting sites. “We hoped that creating a company where employees love to work would translate into delivering the best service for our clients. Based on the Glassdoor.com results, it looks like that has been the key to our success for over twenty-seven years,” said John Dowd, Co-Founder and Owner. 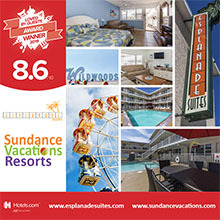 Esplanade Suites, a Sundance Vacations Resort has recently received the Hotels.com ‘Loved by Guests’ global award for exceptional customer service in 2018! 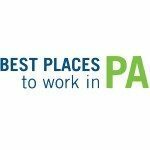 The “Best Places to Work Pennsylvania” list is created by the Best Companies Group. It is a study conducted in the form of a survey given to employees of all the nominated companies. The Best Companies Group compiles all the data from these surveys and ranks the winners on a final list of 100 businesses. Employees are asked to rank the company based on a variety of topics like: Benefits and Policies, Engagement and Satisfaction. The reason our employees love working here include: holiday parties, summer picnics at amusement parks, company T-shirts for events, fitness challenges, team building events like escape room and golf tournaments. 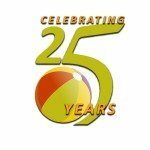 Sundance Vacations, headquartered in Wilkes-Barre, Pennsylvania, is a leading provider of destination-based travel options across the United States, Mexico and the Caribbean, and celebrated its 25th anniversary of operations in 2015. More than two decades of expertise has transformed Sundance Vacations from a new venture with big ideas into a successful travel company with an equally bright future. In 1991, Sundance Vacations co-founders John and Tina Dowd had worked in the travel industry for a number of years. After seeing the limitations of certain vacation companies, the Dowd’s decided to change the way that the industry worked, by providing affordable travel options to the masses. Clearly that idea has proven a successful one as the company has grown from just two employees working from their home to a travel-industry leader that employs over 400 people — which includes 150-plus in the Northeastern Pennsylvania area — across 10 offices throughout the nation. Sundance Vacations services tens-of-thousands of consumers yearly who rely on their expertise and travel knowledge to deliver the best vacations for their families. The company’s idea was, and still is, a simple one: providing amazing destinations and quality vacation experiences for less. Essentially, allowing consumers to buy their vacations in bulk to help lock in a price that will save them money for years to come. And let’s face it, Americans love saving money. For more information on our history, please visit Sundance Vacations Company. 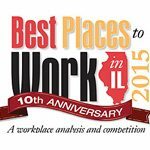 The “Best Places to Work Illinois” list is created by the Best Companies Group. It is a study conducted in the form of survey given to employees of all the nominated companies. The Best Companies Group compiles all the data from these surveys and ranks the winners on a final list of 100 businesses. Employees are asked to rank the company based on a variety of topics like: Benefits and Policies, Engagement and Satisfaction. Other companies ranked on this list include: Edward Jones, Hyatt Hotels and CompTIA. Awarded to Sundance Vacations for their continued effort toward promoting a healthy lifestyle among its employees. View the article here. The Wilkes-Barre Chamber of Commerce has been helping local businesses in the Wilkes-Barre area since 1884. In an effort to improve the area and its resources, the chamber is dedicated to helping local businesses network and grow. Each year the chamber recognizes a local business that is dedicated to helping their employees improve their overall health and well being. You can read the listing for Sundance Vacations on the Wilkes-Barre Chamber of Commerce site. Read more about how we won the award here: "Sundance Vacations is a Step Ahead of the Rest"
Sundance Vacations has received Stevie Awards for customer services and sales for the past 10 years. The Stevie Awards are billed as the world’s premier business awards competition. 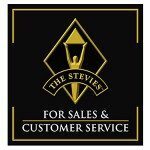 Operating both in the United States and internationally, the Stevies offer categories like the American Business Awards, Stevies for Sales and Customer Service and Stevies for Women in Business. [/one-half] Other companies that have been honored by these awardsinclude: Vizio, Delta Airlines, John Hancock and Office Depot. Discover what other industries we contend with on our Sundance Vacations News site. The Sales and Customer Service awards are designed to recognize businesses with the utmost attention to customer service and client experience. The Inc. 5000 list is put out annually by Inc. Magazine. It ranks the top 5000 fastest-growing companies in the United States. Inc. uses details like, annual sales growth, number of employees and other comparison statistics to rank these companies. Sundance Vacations was named to the Inc. 5000 list for three straight years. Each year the ATSI has an independent panel of judges score the companies on call-handling skills, the top companies each year are chosen to receive the Call Center Award of Distinction. They focus on things like customer relationship management, etiquette, response time and accuracy and courtesy. The ATSI represents more than 350 of the most sophisticated call centers and tele service companies in the world. These companies service more than 350,000 customers in the Unites States alone. Each year the ATSI has an independent panel of judges score the companies on call-handling skills, the top companies each year are chosen to receive the Call Center Award of Distinction. They focus on things like customer relationship management, etiquette, response time and accuracy and courtesy. The Northeaster Pennsylvania Manufacturers and Employers Association Excellence Award is an annual event where companies are honored based on a number of different categories. In 2015, Sundance Vacations received the Excellence Award for Community Involvement based on the company and its employees amazing efforts to give back to the communities that they live and work in. Employee engagement is how in-tune a worker is with the company’s goals and helping the company’s customers. Other businesses that have been recognized on this list include: 3M, Zappos.com, Rogers, Royal Caribbean Cruises and MGM Resorts.